Commander-in-Chief of Defence Services Senior General Min Aung Hlaing who is on a goodwill visit to the Federal Democratic Republic of Nepal, was welcomed by Gen. Ranjendra Chhetri, Chief of Army Staff of the Nepalese Armed Forces on the lawn in front of the office of the Chief of Armed Forces Staff of Nepalese Armed Forces in Kathmandu this afternoon. Also present at the welcoming ceremony together with the Senior General were senior military officers from the Office of the Commander-in-Chief, Myanmar Ambassador to the Federal Democratic Republic of Nepal U Tun Nay Lin, Myanmar Military Attaché (Army, Navy and Air) to India Brig-Gen Thein Zaw. The Chief of Army Staff of Nepalese Armed Forces was accompanied by senior military officers from Nepal. On arrival at the dais, the Senior General was greeted by Lt.Gen. Purna C Thapa, Chief of General Staff of the Nepalese Armed Forces. 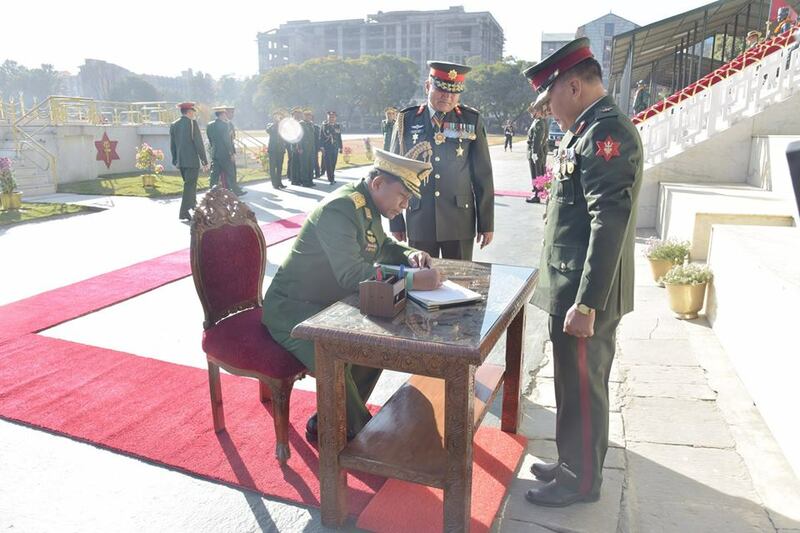 Afterwards, Senior General Min Aung Hlaing took the salute of the Guard of Honour and inspected it. The Senior General held a talk with the Chief of Army Staff of the Nepalese Armed Forces at the meeting hall. 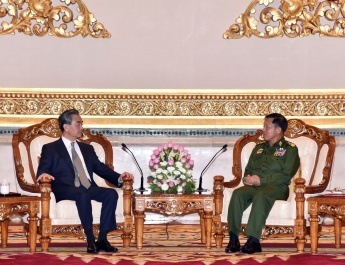 At the call, the Chief of Army Staff of the Nepalese Armed Forces said this was the first and historic visit to Nepal as a Commander-in-Chief of Defence Services of Myanmar. 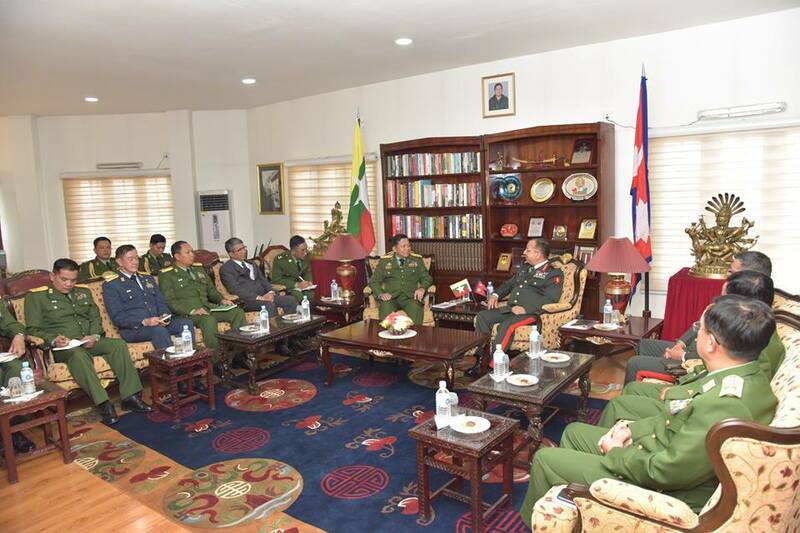 Both sides cordially exchanged views on exchanges of goodwill visits, sending of trainees, promoting amity between the armed forces of the two countries, performing of duties and the winning of titles by Nepalese Gurkha officers and other ranks from the time of Myanmar’s independence struggles till now. After the meeting, the Senior General and the Chief of Army Staff of Nepalese Armed Forces exchanged commemorative gifts. At the meeting hall, Military Operations Director of the Nepalese Armed Forces Brig. Gen. Kaji Bahadur Khatri explained history on emergence of the Nepalese Armed Forces, Nepalese Armed Forces’ participation in the international peacekeeping troops to discharge duty, undertakings of rescue and relief tasks in natural disasters, and peace process in Nepal with the use of power point, and the Senior General asked what he wanted to know. Afterwards, the Senior General signed the visitors’ book at the Office of the Chief of Army Staff of Nepalese Armed Forces. 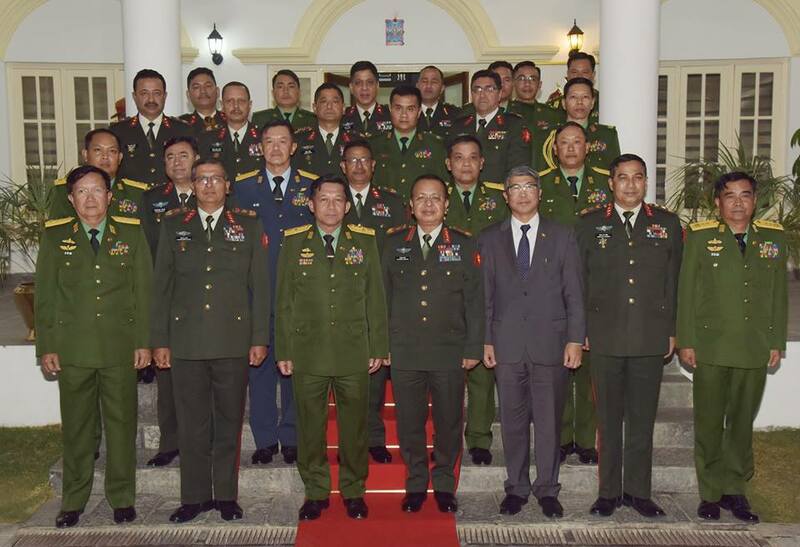 Then, the Senior General and the Nepalese Chief of Army Staff posed for documentary photo together with senior military officers from the both countries. In the afternoon, the Senior General and party laid a wreath at the Bir Smarak, the Army Pavilion, Tundikh, and paid tribute. 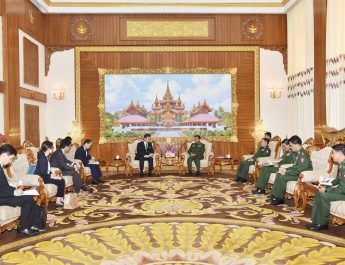 After that, the Senior General signed the visitors’ book and had the documentary photo taken together with delegation members.